The three paintings above are all from art programs designed specifically for people with dementia. Maybe these paintings would not be considered to be great art. On the other hand, they are certainly pleasing to look at, don’t you think? Each painting tells its own story. Each story demonstrats that creating art as therapy for Alzheimer’s really works. John painted this while participating in a Memories in the Making art program. He explained it to the art facilitator: “It’s going around those mountains down below,” while tracing the swirling lines with his finger. Asked about the circle standing alone he explained, “That one’s calm because he is with God.” The facilitator did not understand, but faithfully recorded what John told her. By accurately recording John’s words, the facilitator validated John’s feelings and John was left with a sense of being heard. Painting and drawing, even sculpting, are common hobbies. All are excellent ways to relax, but creating art is more than just a recreational pastime. Art provides a way to reach inside ourselves, to put on paper or some other medium, a representation of thoughts and feelings that we may not be able to express in any other way. Sometimes words fail us. Language is affected fairly early in the progression of Alzheimer’s disease. If you provide care for a person who has Alzheimer’s you have probably, at one time or another, seen him (or her) struggle to find the words to say what he wants to say. The idea is there. He has the desire to communicate that idea to you. He just can’t get the word out. We have all at one time or another felt that the word we need to relate a thought is “on the tip of my tongue”. We just can’t get it out. Imagine this feeling magnified ten- or twenty-fold, and you will start to share the frustration of a person with Alzheimer’s. 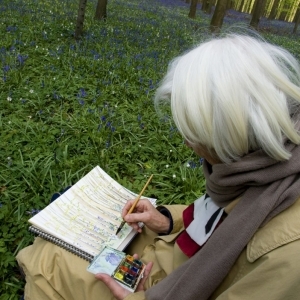 Creativity is affected at a much later stage as Alzheimer’s progresses through the brain. When words are gone, art becomes a more suitable vehicle for expression. Art therapy can use almost any expressive medium; it need not be limited to painting or drawing. Sculpting in clay, dance or creative movement, performance art, creative writing and music, are just some of the other ways to stimulate an individual’s creativity. An inexpensive digital camera makes photography an excellent vehicle for art therapy. Variety is good. Find the art activities that the person or people in your care enjoy doing. 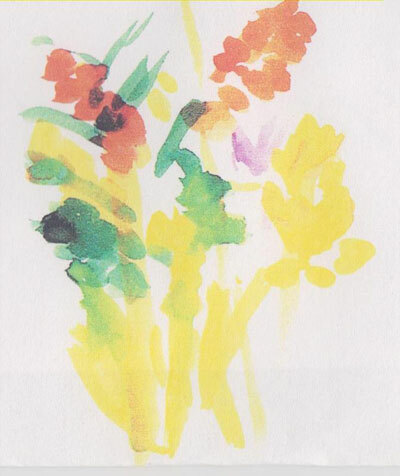 This page shows several paintings that were done by participants in the Memories in the Making program, an art therapy program for people who have Alzheimer’s disease. We used the painting of orange flowers on a blue background on the cover of our first printed catalog, to great effect, we think. A trained art therapist will optimize the benefit of an art activity, but not everyone has that option available to them. We will give you some basics that will allow you to be an effective art facilitator whether you are taking care of a loved one at home, a visiting caregiver, or an activity professional working in a dementia care community. We will also provide references to help you learn more about art therapy. Create a pleasing setting and keep it consistent. Play music to set the tone and to help prime the creative process. The art room should be well lit. Natural light is best, but not always possible. Just make sure the work area is well illuminated. If you are using a model (bowl of fruit, vase with flowers, another painting to be copied), be sure to illuminate the subject, as well. The artist(s) should be as comfortable as possible. Especially if you are working with a group, have all material prepared before your group enters the art room. Being ready to go not only saves time and avoids possible frustration, but it offers a visual clue to what will be happening. If you lead enough sessions, you will eventually be surprised by the artistic quality of some of the work put out by your participants. On the other hand, you must realize that most of the people you will work with are not trained artists. Discuss the art, ask questions, offer praise, but don’t judge artistic content or quality. Communication is one of the outcomes we want from art therapy, or from an art activity. An individual with dementia who has trouble verbally communicating an idea or feeling will often be able to do so while explaining her painting. Discuss the work, individually during the creative process, and as a group when everyone is finished. Be sure to have the artists sign their work. This helps establish pride of creation, but will also help them to identify it later as something they have done. People with dementia will not necessarily remember doing the painting or drawing, or sculpture, but will likely recognize their signature. Keep it enjoyable. If someone does not want to draw or paint or otherwise participate, don’t push it. As a caregiver, you have tricks to encourage participation, and you will learn more. But tomorrow is another day. It is better to move that person to a different activity that to risk them becoming frustrated and angry. Make it about communication. One good way to start a session is to discuss an idea, a concept, a memory that all can share in (like a sunset), or a thing. This is to help the participants focus on one subject. Afterwards, talk about their creations, and record what they say just like they say it. Sharing verbally not only validates their efforts but their emotions and worth. It also exercises verbal communication, which will likely be better at the end of a creative session than they were at the beginning. The following quote is from an article by Karen Gram in the Vancouver Sun, A creative look at dementia. The article highlights the work being done by Dahlia Gottlieb-Tanaka and the Society for the Arts in Dementia Care, in Canada. This particular excerpt renders some insight into the process of conducting an art therapy session for people with Alzheimer’s disease. For 10 years, Gottlieb-Tanaka has been offering creative experiences to people with dementia. She’ll bring in a topic — say, good vs. bad — and they’ll talk about it for half an hour and then the seniors make their own artistic rendition of the concepts. “These are difficult concepts for anyone, not just those with cognitive impairment,” she says. But the residents rise to the challenge and stay totally engaged for the 90-minute sessions. For good vs. bad, one man used a white crayon to draw a glass of water on white paper. Unless you held it to the window, you couldn’t see the image. Gottlieb-Tanaka thought the paper was blank, but he explained that water is so pure, you can’t see it. On black paper, he used the white crayon to make a lot of dots symbolizing disease. “How fantastic,” she says of his interpretation. The following suggested list of supplies will get you started. If you are in charge of activities in a memory care community, you might consider purchasing most of the items on this list. 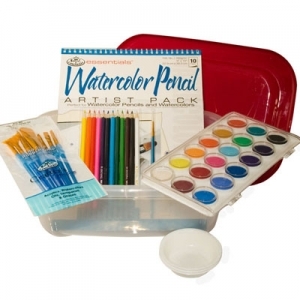 If you are caring for a loved one at home we suggest that you start with the supplies for one art medium; watercolor is a favorite. All you need is some good brushes and the watercolors, paper, and some containers to hold water. To this initial list you might want to add some drawing pencils or colored pencils. You then have a good start on an art activity center. Because many people with dementia like to put things in their mouths, all the supplies must be non-toxic. Art models — be in the habit of collecting objects and pictures that can serve as models to be copied, or to inspire something more. For example, a bonsai plant might inspire a seascape. Easels — painting and drawing can be done just fine on a table, but there’s something about working at an easel…. We borrowed many of the suggestions for implementing an art program from the book Memories In The Making by La Doris “Sam” Heinly. The Memories in the Making Program was developed by the Orange County Chapter of the Alzheimer’s Association in California more than twenty years ago. It is estimated that more than 4,000 artists with Alzheimer’s are currently participating in a Memories in the Making program somewhere in the world. The information that we have given you will allow you to institute a satisfactory art program. If you want to take it to the next level, this book will get you there.